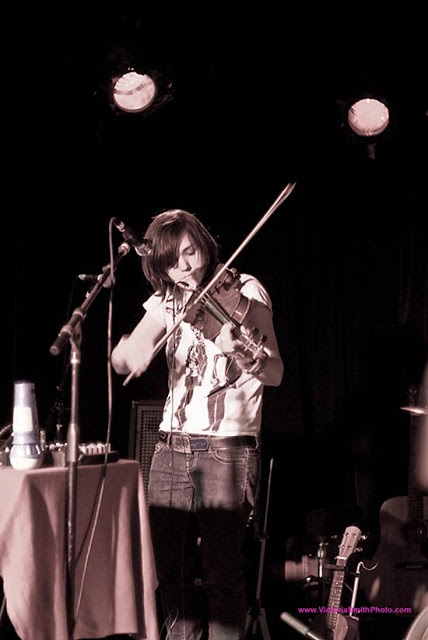 For those unfamiliar with Emily Wells (listen to her hear), she is a classically trained violinist whose passion for classical music is equaled with her passion for hip hop. Her songs are built upon layers of loops of kids’ toy instruments (tiny pianos, and small xylophones), a violin, vocal effects, a bass, and drums. During her live set she is typically accompanied by her drummer, Sam Halerman and bassist, Joey Reina. 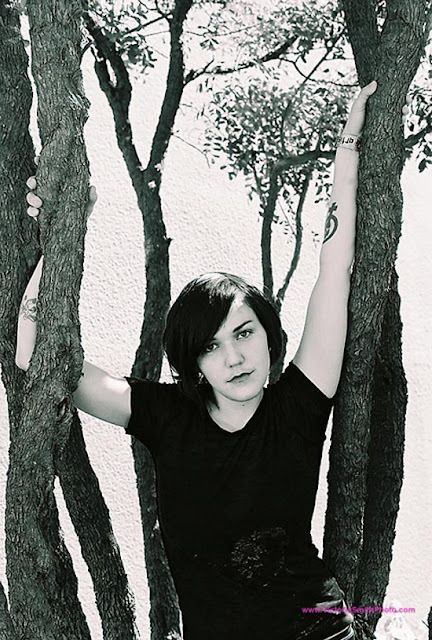 Her styles range in comparisons from CocoRosie, to Citizen Cope, to Miri Ben-Ari, to Esthero, which if you understand those references, is a wide range. It’s astonishing that I can’t find a live review of Emily Wells’ performances, so I’ll begin the trend. Emily Wells, whom states her influences are“Vivaldi, Nina Simone, and Biggie Smalls,” has an equally eclectic sound. On this past Tuesday night at San Francisco’s Cafe Du Nord, Wells played through her entire album, The Symphonies: Dreams Memories & Parties. After her performance two things became evident, her show is a PERFORMANCE and she’s actually creating symphonies. Cafe Du Nord is like a hot sweaty basement and the place was packed, so a guy like me doesn’t fair well in these situations. As beads of sweat built on my forehead, and I tried to hide them from my friend, my focus on Wells remained unfazed. Her achy and yearning voice was haunting and sweet. With lyrics like, “I’m the passenger, give me the keys I wanna try / I’m the passenger / If you give me the keys you know I won’t survive,” from her song “Passenger,” it felt like I was there with her, swigging whiskey while driving through the night on Route 66. If this were her full repertoire she would be whiny, but there’s more. On “Symphony 6: Fair Thee Well & The Requiem Mix,” the pace was quicker, as she stroked the violin it felt anxious, creating a gangsta beat that was edgy and twisted. “I love the studio, it could very well be my favorite place, (especially when it’s raining). So I do a lot of live sampling and looping in an attempt to bring the studio to the stage. All the live looping is like a sporting event, or keeping the first take of every recording. I could fall off the balance beam… which makes it all so much more exciting,” writes Wells on her MySpace bio. In this regard her show IS a performance. Each song has its minute introduction as Wells crafts the loop, while her drummer and bassist wait. Like a symphony her songs progress from a building allegro as she forms the loop, into a full bodied scherzo(click here for: symphony structure ) when her vocals, drums, and bass come together. This merging of classical into hip hop is fuller than contemporary counterparts like Miri Ben-Ari, who’s structure lacks Wells’ complexity. During Wells’ set her presence and charm shine. At one point, she tells the crowd about her meeting with a Christian woman, who “tried romancing me, while trying to convert me and I told her, ‘Sweetheart, we are following a different bible. '” Later, encouraging the fans to shush those in back “just trying to get laid,” because her music wasn’t doing it. As the night progressed she played a new song, “Let Your Guard Down,” but it was “Symphony Number 9 & The Sunshine,” that caught my ear. The crowd was quiet, as she leaned over the small xylophone hitting the notes softly, creating this magical lullaby. As the song built, she added keys while a rhythm clock clicked in the backroom before she began to sing. This song reminds me most of Citizen Cope, and only the good part, as it’s dynamically new in its approach with hints of familiar feelings. While collecting my thoughts I’ve listened to parts of her album, and I’ve become saddened. It feels flatter, and empty. Do not let this discourage you, Emily Wells is a highly talented musician, and her shows are worth more than the effort and ticket price, because few others do, and will compare.